Toymaker pulls Barbie, Batman and 'Cars' characters, citing choking and lead hazard; more recalls may be coming. NEW YORK (CNNMoney.com) -- Mattel Inc. Tuesday recalled more than 9 million toys made in China and sold in the United States, including "Polly Pocket" and "Batman" dolls and other popular figures, because of loose magnets and lead paint - its second major recall in less than a month. The move, announced by the company and the Consumer Product Safety Commission (CPSC), comes after a host of other Chinese products, from seafood and pet food to tires and toothpaste, have been recalled for safety reasons in recent months. 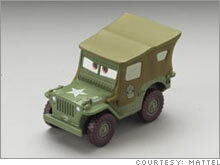 About 253,000 "Sarge" die cast toy cars are among the toys being recalled by Mattel. The lion's share of Mattel's recall included various Polly Pocket dolls and accessories that contained powerful magnets that, if swallowed, could cause significant internal harm. The toys recalled Tuesday were all made in China and posed a choking hazard or contained unsafe levels of lead, according to the CPSC. But the agency said there were no reports of injuries from the toys, which also included a "Barbie Doll and Tanner" play set and the car Sarge from the Pixar movie "Cars." "I apologize for the situation we are all facing," Mattel Chairman and CEO Robert Eckert told CNN. "We'll continue working very hard on the standards, and if we see more issues, we'll promptly notify people." The recall affects 9.58 million imported toys sold at toy stores, discount stores and other retailers nationwide dating back as far back as May 2003. Worldwide, Mattel said the recall includes nearly 19 million toys. During the call, Mattel characterized the magnet problem as a design issue, and blamed a Chinese subcontractor for the presence of lead paint. "They did not do their own due diligence," said Ed Mierzwinski, consumer program director for the consumer group U.S. PIRG. "They relied on Chinese subcontractors - that doesn't cut it." Mattel said it was recalling 72 different products, including 7.3 million "Polly Pocket" dolls and accessories, 345,000 "Batman" action figures, 253,000 "Sarge" die-cast cars, 683,000 "Barbie and Tanner" magnetic toys and 1 million "Doggie Day Care" play sets. 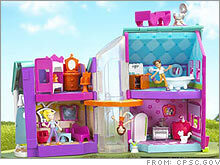 An additional 2.4 million "Polly Pocket" play sets were recalled in November. Retailers including Wal-Mart (down $0.02 to $43.58, Charts, Fortune 500) ordered their stores to pull the affected toys from shelves and stopping them from being sold at registers. Tuesday's announcement marks another devastating blow for Mattel. Two weeks ago the company recalled 1.5 million toys made in China for its Fisher-Price unit due to the presence of lead. The company said the recalls would cost about $30 million. It also followed Monday's news that the boss of a Chinese factory that produced the lead-tainted Fisher-Price toys had committed suicide. Some 70 to 80 percent of all the toys sold in the United States are made in China, according to the CPSC. The agency estimates that hundreds of millions of toys are imported into the United States every year. "The point is when a toy come into the U.S., it must meet U.S. safety standards," Nancy Nord, acting chairman of the CPSC, told reporters after Mattel's announcement. "What I would like to see, at the end of the day, is toys tested in China before they are imported into the U.S."
The recall is the latest development in the growing crisis over the safety of Chinese products. Chinese officials have gone out of their way to stress the safety and quality of its exports, blaming the problems on a small number of companies. Earlier this month, China's Commerce ministry blacklisted 400 export firms following the recent product safety scares. Mattel said consumers should stop using the affected toys immediately and contact the company for instructions about how to receive a replacement. Mattel's launched a Web site (www.mattel.com/safety/) that includes a full list of the recalled toys. Or consumers can also visit the CPSC site to learn which "Polly Pocket", "Batman", "Sarge", "Barbie and Tanner" and "Doggie Day Care" toys are affected. Mattel (up $0.00 to $23.00, Charts, Fortune 500) stock ended over 2 percent lower on the New York Stock Exchange.